Bond Economics: Should We Care About Strong Money Supply Growth? One quite often sees commentators pointing to money growth as proving some point or another (although money's popularity as an indicator has been in a secular bear market). Although I would like to abolish money from economic theory, that does not affect how money behaves in the real world. Despite not being of any particular theoretical interest, the "money supply" numbers (M0, M1, M2, etc.) might be useful for economic forecasting. I do not see much value in money data for the developed countries, but that does not rule out someone else finding some useful relationships. Nonetheless, that is not particularly special -- there are many other economic variables that have useful a useful lead/lag relationship with the economic cycle. “The very early stages are becoming evident,” with unit labor costs beginning to rise and money supply growth starting to accelerate, he said. As a disclaimer, I did not listen to the full interview, so I do not know exactly what Greenspan was looking at. I am not particularly interesting in his thought processes on this question, I am more interested in the general question of the usefulness of money supply data. The chart above shows data associated with the M2 monetary aggregate for the United States (after adjustments by the St. Louis Federal Reserve). The latest annual growth rate was just over 7% in July, which is well above nominal GDP growth. Is this a signal that inflation will pick up? My assumption is that we want to use money growth to forecast economic variables that interest us (such as nominal income growth, or inflation). Some might disagree with that assumption, and that they believe that rapid money growth by itself is significant. However, that still leaves the question -- why do we care about money growth in the first place, other than its alleged effect on other economic variables? We then end up once again needing to see whether money growth has any useful information. Being able to make numerical predictions of the target based on money growth (or the level of money). We cannot predict the level of the target, but we may find that changes in the growth rate of money lead the target variable. Money growth is a good quality coincident indicator of the target variable. 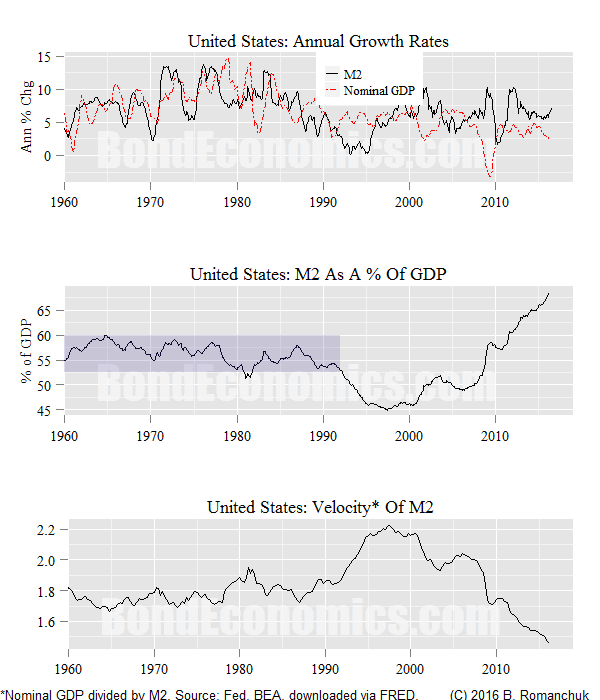 We can slightly improve the fit of a multivariate recession by adding the monetary aggregate to the inputs. Money growth is correlated with the economic cycle, but has no stronger relationship than any other randomly selected economic variable. Yes, But Is It Useful? If we look at the chart at the top of this article, we did see a relatively stable velocity of money. In the second panel, the fact that (adjusted) M2 was largely confined to the range 52.5%-60% of GDP from 1960-1992 is highlighted. (This percentage is the inverse of velocity, but it is more sensible way of looking at the ratio. It fits in with the notion of a stock-flow norm.) Even if the two variables diverged in the short term, we know that such divergences cannot be sustained -- assuming that the velocity remains in this range. (One could argue that the fundamental error of Monetarism was making that assumption.) However, as we see in the post-1992 era, M2 was not preordained to stick with that narrow range. Once we allow the velocity of money to vary a lot, we have almost no information about the relative growth rates of money and GDP. Money could grow faster than GDP for decades without nominal GDP demonstrating any tendency to "catch up -- which is exactly what has happened in the post-2000 era. If we turn to the weaker uses of money in forecasting, the picture is more muddled. I will be writing about this at greater length in my next book, but I just want to highlight why I am not enthusiastic about such uses of monetary aggregates. There is a large number of monetary aggregates to choose from. Fans of money in economics make any number of ad hoc adjustments to the raw money data numbers, for any number of reasons. There are a large number of target variables to look at. Given this level of flexibility, is there any reason to believe that we could not mine through the data and find some form of relationship? Although I am not completely averse to the use of monetary aggregates in these circumstances, my feeling is that they are not more useful than any other credit aggregates. Furthermore, the use of credit aggregates is probably safer than the monetary aggregates. Monetary aggregates are a fairly arbitrary hodge-podge of instruments. (Why would we expect that there is any useful information in the sum of currency in circulation and required reserves? For example, the monetary base in an environment with no excess reserves consists of currency and required reserves, two instruments that make little sense to aggregate, [Updated, since the original was probably too cryptic; I explain in the comments further.]) If we look at credit data, we are more likely to have a cleaner read on what is actually happening within the economy. I would like to answer your concluding question, even though it is rhetorical. I would say that is an historical accident, an artifact of the gold standard and and the early days of fiat money, during which broad money growth was believed to be controlled by base money, on the grounds that the central bank controlled base money and that the private sector could convert one component of it (currency) into another component (reserves) at will. A fearsome amount of people's intuition comes from the gold standard era. I know you know this. I am just chewing the cud with you. On the substance, I assume the opportunity cost of M2 has fallen quite a bit. Maybe M2 money growth is quickening in a lagged response to that. If it is only that, then there is no spending signal, even on "monetarist" grounds. Not sure. But that would fit your conclusion, I guess. Separately, could somebody please explain why Steve Williamson is wrong? He just has to be, but I concede I can't prove it. Would be a pity to have gone through the career with the wrong sign on the interest rate. I agree that there's a lot of Gold Standard intuition. In a longer version of this article which is supposed to go into my book, I noted that money growth by itself is of interest within the Gold Standard, as that implies that the cover ratio is dropping. Even if there are no effects on other economic variables, the possibility of a run on the currency increases. With a reserve ratio of less than 100%, the private sector can't convert 1:1 between the components of the monetary base (assuming there are no excess reserves, which is a pretty good approximation of pre-Crisis behaviour). Without excess reserves, banks (in aggregate) cannot convert reserves to currency; they need to sell some asset to the central bank (or borrow via repo) in order to create excess reserves to exchange for currency (vault cash). If a depositor withdraws $10 in currency from a bank, and the bank needs to recharge its vault cash, and we have a 10% reserve ratio on deposits, required reserves only drop by $1. The bank will need to sell $9 worth of assets to raise the missing cash. If we look at the components of the monetary base, currency increased by $10, but required reserves only fell by $1. That is, the monetary base will increase as a result of a depositor portfolio shift decision. What did Steve Williamson write/say that is supposed to be wrong? Agreed with your conclusions. The interesting aggregates are changes in Z1 and government deficit, this tells all we need to know about how much "money" is entering the economy (although it tells nothing about it's distribution), and respectively in what 'quality' (being govt deficits of higher grade and quality, as pure net savings for private sector). Accounting for shadow "money" (or credit) is harder, many times we don't know what is shadows after-the-fact (when it collapses and has to be made good through CB intervention ala 2008). Forms of shadow credit are of the worst "quality" (banking credit being in-between HPM/fiat and shadow money). The obsession with the other monetary aggregates and the monetary base comes from Austrian economics influence, but principally from monetarism. Being underlying school of thought regarding monetary theory (yet) it will be hard to get rid of it until monetarism finally dies. You can track the growth in many monetary aggregates to the transformation of credit and shadow money into reserves and fiat. Is a "macro tool" for balance sheet stabilization, nothing else. When the central bank does Quantitative Easing (QE) with a non-bank it injects fresh new transaction accounts (checking deposits) that tend to increase the M1 money supply (mostly the sum of checking deposits plus currency in circulation outside banks). If the non-banks do not want to hold currency or checking deposits then the funds migrate to small time/saving deposits (M2) or to other liabilities of the aggregate bank sector. The levels of M1 depend on the non-bank demand for checking deposits and currency and are a residual of the interaction between banks and non-banks over the longer run regardless of whether the initial source of M1 was the asset expansion of the central the bank or the asset expansion of the aggregate bank sector. Whenever the central bank keeps the level of reserves "scarce" (to retain control over the interbank rate of interst) it must also service the currency drain for the banking system. Otherwise banks would run out of reserves. If there are required reserves then the central bank must provide them too (so there is no "tax" imposed since it costs banks nothing to obtain such reserves). A banker thinks he is being taxed because the required reserves seem to be sitting there earning no interest, however, the central bank would probably drain the required reserves to keep control of the interbank interest rate if it did not impose the requirement, and the banks would not have reserves sitting there appearing to be a "tax." To service the currency drain in the United States the Federal Reserve System purchased Treasury securities in the open market. If the majority of securities were purchased from non-banks then this would inject reserves and checking deposits into the aggregate bank equal to the amount of currency withdrawn. However reserves would not accumulate because banks would lose reserves as currency is withdrawn and Fed would only put back enough reserves to control the interbank rate of interest. Checking deposits do not increase due to Fed servicing the currency drain because banks debit (decrease) checking when a customer withdraws currency. I have never read a paper by a monetary economist that describes this process, however, I did notice in a paper by Peter Stella that Fed kept its Treasury assets roughly equal to the currency in circulation prior to the financial crisis in 2007-2008. This makes sense based on my description of the central bank servicing the currency drain. "If we look at credit data, we are more likely to have a cleaner read on what is actually happening within the economy." "Bank credit for GDP-transactions explains nominal GDP best." I used to work at BCA - Bank Credit Analyst. It was not a rating agency, rather the name came from the explanatory power of bank credit. I'll try to add some theory to reinforce your conclusion. If government borrows from the private sector to enable spending, there should be no change in the money supply but GDP can be expected to increase. "(8) Fiscal policy can crowd out private demand even when there is less than full employment. Furthermore, our finding is in line with Fisher’s and Friedman’s argument that such crowding out does not occur via higher interest rates (which do not appear in our model). It is quantity crowding out due to a lack of money used for transactions (credit creation). Thus record fiscal stimulation in the Japan of the 1990s failed to trigger a significant or lasting recovery, while interest rates continued to decline." Postkey, I don't understand that quote. Can you explain it more? What does quantity crowding out do to a lack of money mean? And why would interest rates decline when there was a lack of money? This doesn't make sense to me either from the loanable funds framework (which I think is mostly wrong), or from an endogenous money point of view.